Two programs that would make “Princess Bride” antagonist, Inigo Montoya, proud, when you look at the paths that the host Crusaders and their guests from Athol Springs, the Red Raiders of St. Francis, took to reach tomorrow’s state game, you could most definitely say that both were in the “revenge game”. 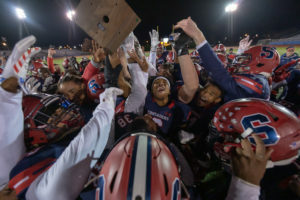 Winners of their last nine games combined, the defending state titlists from Stepinac would reverse a 36-34 regular season loss in the semifinals by defeating Iona Prep 37-26, and then followed it up by fighting back from a 12-point deficit to sweep Cardinal Hayes, 29-18 in last weekend’s NYCHSFL League Championship contest; In the case of St. Francis, they would transform 43-41 and 25-22 losses to St. Joseph’s Collegiate Institute and Canisius respectively in October into 48-22 and 20-16 postseason triumphs. A rematch of the 2015 title game, which Stepinac won by a score of 42-28 en route to a perfect season (12-0) and their first state crown, the school from White Plains will be hunting for their second straight title and the third overall in program history, whereas their foes from the Monsignor Martin region will be looking to hoist state hardware for the first time ever. Interestingly, in the five-year existence of this NYCHSFL vs. Monsignor Martin battle for Catholic supremacy, no region has won the game twice in a row and the host school has yet to prevail. Hence, before the first snap of the game even occurs, if you are Red Raider Head Coach, Jerry Smith, you already have a natural inclination for optimism. With each team averaging over 37 points per game in the midst of their mini winning streaks (Stepinac six in a row; St. Francis three straight), as long as the weather cooperates, there is every reason to believe that just like the previous occasion that these two schools met for the spoils, you can expect fireworks and a plethora of scoring throughout the 48-minute affair. 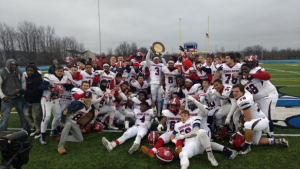 On paper, Stepinac boosts the more well-balanced offense, as they possess both a 2,000-yard throwing quarterback [junior Joey Carino] as well as a 1,000-yard rusher [Malik Grant…However, the aerial attack of St. Francis, led by super sophomore signal caller, Jake Ritts, and his quintet of potential targets—Dominik Thomas, Noah Kunzman, Xzavier Janczylik, Antonio Corsi, and Mark Arrizza—is so lethal, that in true Vince Lombardi fashion, they could send you their playbook and you might still struggle to stop them from lighting up the scoreboard. Carino, who in his first season under center, successfully led the Crusaders to their fourth downstate Catholic league title in the past five years, is an individual who just seems to get better with each subsequent outing…Picked off three times in the team’s last loss on October 6th, since that surprising loss to Chaminade High School, he has enjoyed a 14:1 touchdown to interception ratio and has hurled for 250 or more yards in three of his last six appearances…Factoring in the 10-for-16, 254-yard, 3-TD effort he posted on November 17th in the NYCHSFL finals, he is completing 70.2% of his attempts while averaging 232 yards 2.7 touchdowns throwing during the 2018 playoffs…On the year, he has compiled a stat line that reads as follows: 127-for-222 (57.2%) for 2,050 yards and 22 touchdowns. On the back end of half of those TD strikes has been one of, if not the most electrifying playmaker in the downstate Catholic league this season, Shawn Harris Jr…Ranked 2nd in NYS with 1,151 receiving yards (56 catches, 11 touchdowns), the 5’11, 175-pounder out of Mount Vernon, is fresh off of being named the Offensive Most Outstanding Performer last weekend when he made seven grabs for 162 yards and two touchdowns, and added a three-yard TD run in Stepinac’s league title win over Cardinal Hayes…A threat EVERYTIME he has the ball in his hands, The Stony Brook University verbal commit has logged multiple touchdowns in all three of the Crusaders’ postseason games this season. He has averaged seven grabs for 163 yards during the playoffs…In the 2017 title game (49-28 win over Canisius), he scored twice, rushing for one TD (10 carries, 86 yards) and catching another (3 grabs for 92 yards)…While their numbers may not stand out the way their previously cited counterparts on the Red Raider sideline do, Eugene Boyd (12 catches for 216 yards, 2 TDs), Nick Furio (11 catches for 131 yards, 1 TD), and Dom Nicolo (10 for 175 and 2 touchdowns). Boyd had a 53-yard reception last weekend that led to a backbreaking Stepinac touchdown in the 4th quarter; Furio made two catches for 48 yards, including a TD reception last Saturday; Nicolo has been quiet during the playoffs, but showed his talent and potential when he had a 4-catch, 94-yard, 1TD performance against regular season champs, St. Anthony’s….As we have mentioned in past previews, CJ Wise is the jack of all trades for this offensive unit, as he is second on the team in both rushing yards (507 and 2 touchdowns on 69 carries) and passes caught (24 grabs for 275 yards, 2 TDs). He has gained 111 yards on 19 touches (5.8 average) during the postseason. Prior to last week (zero catches) he had made at least two grabs in seven straight games. Turning our attention to the 2018 NYCHSFL Triple-A rushing king, Grant, next to Harris, there may not be a more clutch student-athlete for the Head Coach, Mike O’Donnell’s squad…Two weeks removed from setting a league record with 405 yards rushing in the semifinal victory over Iona Prep, the senior from the Bronx simply knows how to elevate his effort when the stakes are at their highest. Accumulating 657 of his 1,366 yards this season during the playoff stretch, Grant first turned heads and commanded attention in last year’s state title contest, when he rushed for a team-leading 130 yards on just 11 carries against Canisius…Grant had a modest (by his high standards) 82-yard effort last weekend; hence, it goes without saying that in his final appearance as a Crusader, he is going to want to put an exclamation on his scholastic career. Returning four starters (James Prince, Jonathan Mucciolo, Ajani Cornelius, and Shadi Rabadi) off of an O-line that enabled Stepinac to run for 338 yards and three touchdowns in the 2017 state title game, the addition of 247Sports 3-star recruit/future Temple Owl, Chris Fowx, has only added to the dominance in the trenches for the red, white, and blue juggernaut…A.S. needs just 113 yards of total offense to reach the 5,000 mark for the second season in a row. As noted above, the road-warriors from Athol Springs will attempt to counter all of the Stepinac firepower by marching out the most prolific passing arsenal in the entire Evil Empire….The state leader in passing yards with 3,089 and third in touchdown hurls with 35, only once this season has Ritts been held to just one TD throw in a game…On the contrary, he has tossed for three or more scores in eight of his 11 appearances, including a 276-yard, three touchdown display on November 3rd in the Monsignor Martin semifinals against Joe’s Collegiate….The definition of the term gunslinger, the sensational 10th grader is averaging 30 pass attempts (19 completions) and 281 yards this season as the Red Raider field general…In two playoff games this season, he has completed 32 of 54 attempts for 485 yards and five touchdowns. One of the reasons why Ritts has thrived in his second season on the St. Francis varsity has been the stellar play of the five-man receiving corps acknowledged above…Thomas, who also happens to be a stud on the wrestling mat (2x defending CHSAA State Champion for Coach, Mike Messore) is the veteran presence/#1 target for this talent-rich cohort of youngsters. The only senior among the group, 6’1, 185-pounder [Thomas] tops all receiving categories with 52 catches for 934 yards and 14 touchdowns (3rd in NYS). In the postseason wins over SJS and Canisius, Thomas combined to catch five balls for 65 yards and one touchdown…Kunzman (39 catches for 431 yards, 3 touchdowns) and Corsi (27 catches, 430 yards, 6 TDs), who are also just sophomores, will be tearing up the gridiron for the next two years with Ritts. The former has posted five grabs for 53 yards in the playoffs, while the latter brings a lot of momentum with him to the field this weekend, after a 5-catch, 86-yard, 1TD performance in the Monsignor Martin finals…Janczylik, who is a major contributor as a pass-catcher out of the backfield, is third on the team in receptions (35) and second in both yardage (535) and touchdown receptions (8). In the MM semifinal win over St. Joe’s, he established a season-best with 128 yard receiving on five catches and then complemented it with a four-catch day in the finals win over Canisius….Arrizza, who has not been credited with a catch since October 20th (possible injury?) has compiled 20 a catch, 277-yard junior campaign. Because their vaunted aerial game has been so spectacular, there could be a misconception that St. Francis is weak on the ground. Nothing could be further from the truth. The pass may be featured, but St. Francis is plenty capable of chewing up yards on the ground too…A true all-purpose tailback, Janczylik may have only run for 681 yards and seven touchdowns this season, but that is mainly due to a lack of opportunity as opposed to productivity. Getting less than 10 carries in seven of the team’s 11 games, when he has taken the hand-off, the 5-8, 175-pounder has gotten the job done, averaging 7.0/carry…Like his peer on the other sideline [Grant], he too has flipped the dial up a notch since the start of the playoffs. Surpassing 100-yards just once during the regular season, Janczylik has now emerged with back-to-back century mark effort, cruising for 131 and two touchdowns (on seven carries) in the semis and then tacking on a 102-yard showing in the MM title game. Defensively for Stepinac, a lot of the press in the past has been focused on the run stuffing/pass rushing abilities of front-7 members such as Kevin Gray (127 tackles, 8 sacks), Kevin McKenna (113 stops, 9 QB bags), De’Andre Smith (86 tackles), Doug Simmons (69 tackles, 11 sacks) and last weekend’s NYCHSFL AAA Championship Defensive MVP, Joe Garbowski (69 tackles, 8 sacks)…But alas, because of the known proficiency in the air of St. Francis, in order to on November 24th, we feel that Stefan Romero (41 tackles, 13 pass break-ups), Cory Richards (35 stops, 12 PDs), Jamel Fleming (32 tackles, 9 pass defenses), Dexter Chance (40 tackles, 2 INT, 2 PDs), and Mekhi Green (51 stops, 4 pass break-ups) could all materialize as game-changers in the secondary. St. Francis, which surrendered an average of 37 points during the regular season (misleading when you consider that they played a very ambitious schedule that consisted of opponents from PA and OH, as well as NYSPHSAA State finalists, Aquinas Institute) has really found their groove in the postseason, trimming their allowance to a very reasonable 19 per game…And even though we are more familiar with the Stepinac student-athletes, we could not help but recognize that there are some major studs on the Red Raider defense too…Dawson Tyger (77 tackles, 2 fumble recoveries), Matt Jaworski (76 stops, 2 caused fumbles), [Dom]Thomas (66 tackles), Reilly Miller (52 stops), David Hayes (49 tackles), [Antonio] Corsi (43 tackles, 3 sacks), and D’Andre Jones (27 tackles, 1 sack) seem to be the names to know along the DL and LB units…Dan Browning (66 stops, 4 INTs), Janczylik (20 tackles, 2 interceptions), Jaron Alexander (8 tackles in the Monsignor Martin finals; 12 total postseason stops), Thomas Bestpitch (29 tackles, 1 pick), and Ian Snyder (28 tackles) are all integral assets along the last line of defense. 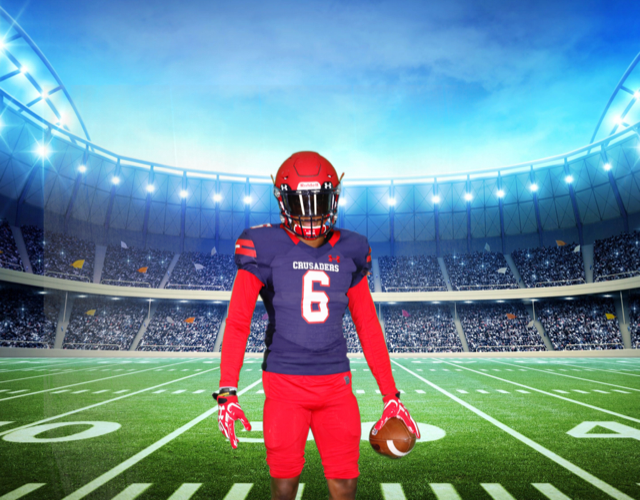 NOTE: For those unable to attend the game in person, Local Live (http://locallive.tv) in conjunction with Archbishop Stepinac High School, will offer live and archived webcasts of tomorrow’s festivities…Registering for a free account may be necessary in order to view the broadcast.